When driving down country lanes visibility is often restricted by bushes and very limited round bends. All too often drives can be concealed making it very difficult to pull out from. 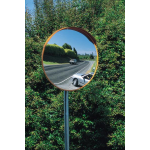 In order to eliminate blind spots and help drivers avoid accidents and traffic collisions we have a fantastic range of traffic mirrors. 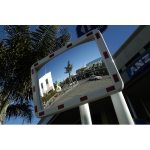 These mirrors are placed on corners, driveways and concealed exits making it easier for drivers to see other drivers coming towards them. 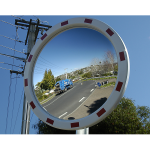 What's great about these products is that they have high visibility red and white edgings to make them easy to spot and all drivers aware of the mirror, meaning they can use it to their advantage. 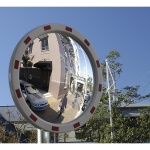 It can even resist against the harshest weathers and vandalism. Within our range, you can will find a range of sizes and designs, so don't worry if you couldn't find the product you desire elsewhere because we have it right here. 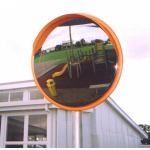 However if you're looking for something slightly different, we have external and internal security mirrors available now.